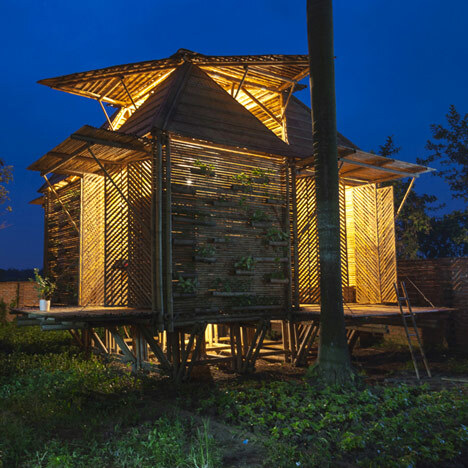 • Online architecture and design magazine Dezeen featured a prototype bamboo house in Vietnam designed to withstand floods up to three metres above ground. From there I followed links to posts about the stunning Wind and Water Bar and more light and spacious low-cost bamboo housing. • If you have a stray few thousand dollars for a handbag, Gucci have a line of bags with bamboo handles. Free shipping! • Paddling a bamboo raft to school looks like more fun than catching a bus. • Thailand’s The Nation newspaper can always be relied upon for feel-good stories from rural Thailand. This story details a community enterprise in Lampang, in the north of Thailand. A range of items are produced and production waste converted into charcoal briquettes for cooking. Translated, the community has added nearly 40 acres of land a year to its existing bamboo plantation of 1,384 acres. This earns the enterprise between about A$ 6,800 and A$ 10,300 a month.